At the height of his stardom he directed his first movie, The Adventures of Sherlock Holmes’ Smarter Brother. No, not Mycroft, we’re talking about Sigerson Holmes. To be honest it’s not a very good movie but you can tell it was a personal project as he cast his buddies Madeline Kahn and Marty Feldman and included scenes that show off his considerable fencing skill, honed at the Bristol Old Vic Theatre School in Bristol, England, where he was the first freshman to ever win the All School Fencing Championship. As I said, the movie isn’t the greatest but it’s certainly charming and has it’s moments. It plays like a less-manic Mel Brooks movie, probably because it basically is a Mel Brooks movie, without Mel Brooks. Gene married Gilda Radner in 1984 and they appeared in several movies together but it turned tragic when Gilda was diagnosed with ovarian cancer in 1986 and passed away in 1989. Gene retired from public view for a time but still did occasional TV work. He hasn’t appeared on screen since 2003, when he won an Emmy for his role as Will’s boss on Will & Grace. 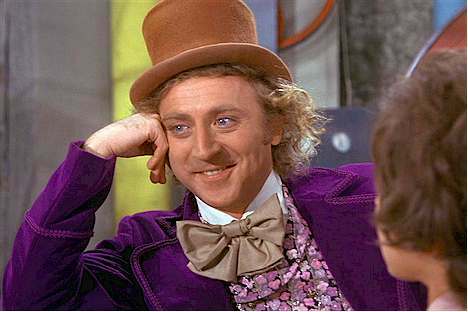 I recently saw a documentary on his life, Role Model: Gene Wilder, where he’s interviewed by Alec Baldwin. It was kind of a shock to see him so old, he’s nearly 80 now. After a lifetime of seeing his movies over and over again combined with him being mostly out of the public eye for so long I suppose he’s forever fixed in my mind as being ageless like Willy Wonka. The documentary is highly recommended, Gene tells some great stories and just seems like the nicest, sweetest old man. No surprise since that’s who he seemed to be his whole life.